On paper, the sd Quattro has a bang up-to-date viewfinder and screen. Its EVF uses a 2.36-million-dot panel and offers a magnification equivalent to 0.73x. The 3in rear screen has a 1.62-million-dot resolution, although it’s fixed rather than articulated and not touch-sensitive. One nice feature is the addition of a small OLED sub-monitor alongside the LCD that displays key settings such as shutter speed, aperture, metering mode, ISO and exposure mode. In practice, both the viewfinder and screen are bright, clear and sharp. But they’re badly let down by a low-resolution live-view feed, which appears pixelated and over-sharpened. This is particularly obvious when using the EVF, and is a shame because the rest of the on-screen interface is so good. One nice touch is a large switch beside the eyepiece that allows you to select between viewing with the EVF or LCD or changing between the two automatically using an eye sensor. It’s much more intuitive and satisfactory than having to cycle between modes by pressing a button, and I wish more camera makers would follow suit. When using the EVF, the rear screen can be set to display the camera’s detailed status, or turned off completely to conserve power. I mostly preferred to use the electronic viewfinder, reverting to the rear screen for tripod work. The EVF’s position to the right of the camera does feel odd, but it works OK when you get used to it. The large eyecup does a great job of blocking glare, and because it protrudes so far from the back of the camera, there’s no problem accessing any of the buttons with the camera to your eye. The sd Quattro will preview your exposure, white balance and colour mode, giving a good idea of how the image should turn out before you press the shutter button. Lots of useful extras can be overlaid on the live-view display, including gridlines, a dual-axis electronic level display and a live histogram. 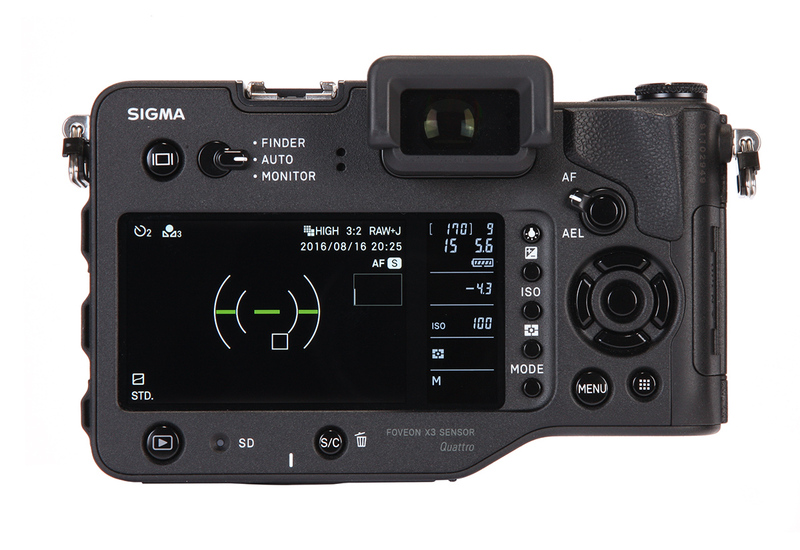 Indeed, users can configure up to four custom views each for the EVF and LCD, and cycle through them using the display button. Mystifyingly, I could find no way of engaging depth of field preview; instead, the camera always views with the lens set wide open. This is one area where mirrorless cameras should have significant advantages over DSLRs, as their electronic viewfinders can show accurate depth of field at large apertures and don’t necessarily go dark at small apertures.